Dr. Patrick Mbajekwe teaches African history at Norfolk State University. Most people believe that African history started with slavery, but there’s much more behind it. Norfolk State University (NSU) associate professor of history and interdisciplinary studies, Patrick Mbajekwe, seeks to teach students that there’s another side to Africa’s distinct background. Mbajekwe, 50, grew up in the village of Onitsha located on the eastern bank of the Niger River in Nigeria. He was raised by his grandparents where his grandfather served as chief of the village. For him, life was good as there weren’t many restrictions. “It was a very good life. Of course, as you get older the challenges of life naturally set in. Responsibilities start arising,” said Mbajekwe. After receiving his bachelor’s degree at the University of Nigeria in Nsukka and his master’s in African history from the University of Lagos in Nigeria, Mbajekwe came to the U.S. in 1994 to pursuit history graduate studies. He obtained his Ph.D. from Emory University in Atlanta, GA. Originally planning to return to Nigeria once he obtained his degree, Mbajekwe decided to make the U.S. his second home with his wife and four sons. Mbajekwe knew that he always wanted to teach at an HBCU. 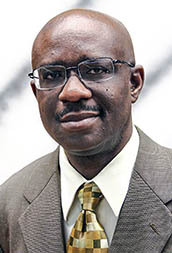 His first experience with an HBCU came while pursuing his Ph.D. Emory University studied a joint program with Dillard University in New Orleans. He was one of the students who entered Dillard University’s Mellon Graduate Teaching Fellowship, which is designed to help students wanting to teach at HBCUs. After receiving his Ph.D., Mbajekwe taught at American University in Washington, D.C. and at Appalachian State University in Boone, North Carolina, both a year each. He also taught at Old Dominion University for three years and at Kenyon College in Gambier, Ohio. Once the opportunity arose, he came over to NSU to fulfill his dream of teaching at an HBCU. “You know the saying ‘You do what you love’ and, for me, it’s primarily about just something that I love to do and I just do it,” said Mbajekwe. The African history class talks about Africa’s historical periods from the 16th century to the 21st century and to use the right content, concepts, and ideas for understanding. Mbajekwe said the class also teaches students to use skills needed for outside the classroom, such as writing and critical thinking. The class is a general education class, though it also falls under a cultural elective. Mbajekwe believes that when it comes to teaching about African history, Africans are the ones who can give the clearest accurate account of what happened before slavery. “I always believed that as an African, that if you don’t tell your story no one will tell it for you. I do believe that Africans are the only ones who can set the record straight as far as their history is concerned,” he said. Despite being from Nigeria, Mbajekwe’s teachings are not Nigerian-centered. He said he tries to be as broad as possible about teaching different parts of Africa. “My students know that Nigeria is my home and Nigeria is a big country on the continent, but my perspectives are broad-based,” he said. Mbajekwe feels that the reason more people should learn about Africa’s background is that it’s the most misunderstood history-wise. It, along with all histories, are pieces of a puzzle and one needs them all together to get a full perspective of world history. He hopes his teachings will show that Africa is a big continent that’s very diverse in historical experiences, cultures, and ideas in philosophies. Mbajekwe also wants to show that Africa’s history constantly changed throughout the ages and help students recognize those changes, from looking at episodes in history, moments, themes and different regions of the continent. “Mbajekwe is very quiet, but when he speaks, everyone listens,” said assistant professor of history, Stephanie Richmond. As Mbajekwe has a fondness for all of his classes, he places passion in all of them equally. The one that stands out to him the most is modern African history since it engages students with what they know and what they may have heard. Mbajekwe occasionally takes trips back to Nigeria both to visit family and to continue his research. Tags: African, history, Mbajekwe, Norfolk State, NSU, Patrick Mbajekwe. Bookmark the permalink.